We use four pins from the DB9 connector. Pin 1 is labeled on the back of the pump as the upper right corner of the female connector. Pin numbers are also on all connectors. 6/7: This is required to tell the pump to run when in EXT mode, as it will be when we are controlling the speed via the 0-10V input. The front start/stop control will not work. Instead, the user must hit the Int/Ext button in order to manually stop the pump via the panel. Five different ways of stopping the pump are listed on the Software Perfusion Monitor page. What's not shown above is how the two green wires are then joined, soldered and insulated with shrink tubing a few inches from the connector. Alternately, pins 6 and 7 could be just be bridged with a short piece of wire if the quality is good. In the DAQ Wiring Box, only the withdrawal pump needs to be wired for reversal, so the other pump jacks do not have a black wire. The shrink tubing shown in the picture is not always necessary. 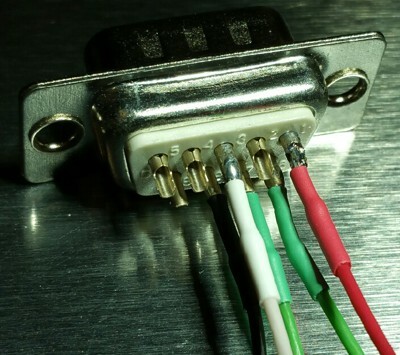 It's generally used inside the Wiring Box, even covering the solder connections more than shown. It's generally not used inside cables as long as the wires are not too flexible. It's preferrable to use store bought M/F DB9 extension cables. Backup cables of different lengths are kept on hand. If making a cable in house, then all 5 pins on both ends should be hooked up so that the cables can be swapped to any pump. The pump used by ANB must have pins 1 - 3 bridged. Pin 5 is the hot wire. ISMATEC Reglo ICC is a double-headed pump used by ANB. It does not support voltage input, so it is hooked up to a USB to Serial Converter and is run with ASCII commands. After plugging in, go to PC, right click, Manage, Device Manager, Ports. Find the USB to Serial Converter, and make a note of the COM#. Use that in the Config File. Support is limited to a single double-headed pump that is not mixed with other pumps. Reglo flow was calculated as follows. In the Reglo ICC Operating Manual, on page 16, it lists tubing order number SC0072T. This is the only tubing that is currently supported. This tubing has an ID of 2.79, and a flow rate of 31 mL/min at 100 rpm. Old head is 7518-10, easy-load, compatible with L/S 25, L/S 17, L/S 18, and others.